I know, I know. The Middle Ages aren’t the “Dark Ages” anymore, and we’re beyond the Gothic literary legends of infanticidal nuns and beyond the tourist trap museum “medieval torture devices” and even beyond necessarily taking our actual medieval sources at face value. But even if some of these reports skirt the boundaries among truth, rumor, and legend, let’s do this thing because GAME OF THRONES COMES BACK SUNDAY; DO YOUR WORST, HBO. 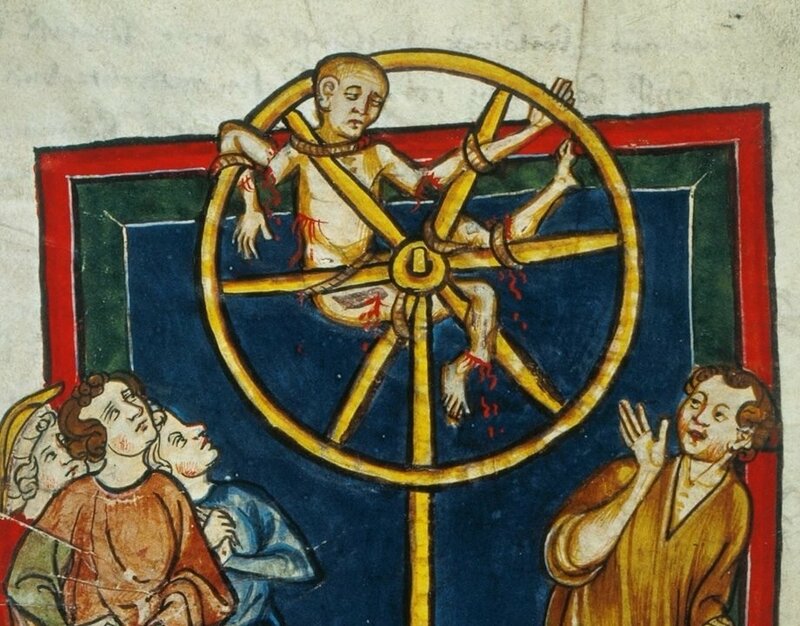 Being broken on the wheel in the 14th century. In a world where driving a massive wooden post through someone’s chest was considered a humane shortcut to a full execution by live burial, it’s pretty clear that there was no such thing as a “cushy” medieval execution. Still, contemporary commenters and law codes seemed to settled on two particular modes as the worst: drawing and quartering, and breaking on the wheel. In the first, whose brutality and finesse merited the highest compensation for the executioner, the condemned person would be strangled just far enough to still be conscious, then have to witness and feel their own slow disembowellment. At the sentencing judge’s discretion, they might have their limbs chopped off, have to watch various body parts burnt in the fire, or experience the “mercy” of being beheaded before their body was chopped into pieces to finish off the spectacle. To break someone on the wheel, the execution would tie the person down to a wagon wheel spread-eagled. With a heavy blunt object, he would smash the person’s limbs in the spaces between the spokes, so the limbs would snap. In a variation, the condemned person might be staked to the ground with blocks placed underneath their limbs to simulate the spokes of a wheel. The executioner would start from the feet and gradually work their way up—bone-snapping hit by hit by excruciating hit. Sometimes there might be a finishing blow to the neck or head; other times, the wheel would be hoisted onto a pole and the person left to die. These two modes of execution were, all agreed, the worst handed down by law. In 1302, Simon Hannabaert was broken on the wheel and then drawn and quartered. For someone perhaps best known for her means of death, Brunhild thrived through an astonishing seventy years of reaping revenge for her sister’s murder, ruling through her husband as queen consort, seizing rule as regent for her sons, seizing rule again as regent for her grandsons, and seizing rule as regent for her great-grandson. She won the friendship of Gregory the Great and Gregory of Tours and played a pivotal role in the Catholic Christianization of Francia. Ultimately, it took every duke in two united kingdoms to defeat her forces in battle. When she and the nominal king were captured, he was executed quickly. But Brunhild? Each of her limbs was tied to a different horse, which were sent galloping off in four different directions. In Canto 33 of Inferno, Dante and Virgil happen across two sinners buried together in the same hole, with just their heads sticking out. And one of them, Ugolino della Gerardesca, is eternally gnawing at and consuming the head of the other. The story of Ugolino’s prophetic dream and his heart-rending report of his children’s suffering are Dante’s invention, but the origin is not. After falling out of favor with the citizens of Pisa in 1288, Ugolino and his male family members were arrested and imprisoned in the tower of Muda. And one day in 1289, rather than send up soldiers with food like normal, the archbishop ordered the tower sealed, the keys thrown away, and the abandoned family to slowly realize their grim fate. An unpleasant end for all the warring parties present, but let’s remember that Dante even places the one he likes, Nino Visconti, in purgatory. Anselm (“little Anselmuccio”), on the other hand? Was only fifteen at the time of his murder. John de Lanzous was a noble from the countryside around Laon who picked a bad time to pick a fight with a city official. He fled to the local cathedral for safety after punching the clerk in the face, but it offered little sanctuary in the end. John, along with another noble and his brother, were dragged through and out of the cathedral by their hair and street. They were beaten with sticks, weapons, and fists by any townsperson who wanted a chance. John somehow managed to survive the mob violence, so he was tossed into the local jail. He was tortured to death by having the bottoms of his feet and the tendons of his joints sliced. Henry’s heart was smitten by melancholy. Taking guidance from the Devil he got into a hot bath and opened veins in both arms; and in this way of his own free will, no, free folly, ended his life. Now, our primary chronicler for this entry and the next, Michel Pintoin (the “Monk of Saint-Denis”), was describing events in southern France from quite a safe distance in Paris. But he assures us that every word came from “witnesses worthy of trust,” and wouldn’t you take at face value the writing of the official royal propagandist chronicler who had a vested interest in making the Tuchin rebels look as barbaric as possible, or as he says, even worse than barbarians? John Patrick, according to Pintoin, wasn’t even involved in the revolt or fighting against the revolt. He was an ambassador from Scotland to Aragon just passing through France on his way. But the rebels took him for an example of the royal (taxing) authority they rejected, seized him, and forced a red-hot iron crown onto his head. On another day, they stopped a priest on his way to the papal curia in Rome, and out of hatred and distrust for his ecclesiastical dignity, they cut off the ends of his fingers, peeled the skin from his body with shears, and then burnt him alive. The Bal des Ardents depicted in a 15th-century miniature from Froissart’s Chronicles. A proper medieval feast had more to do with the pageant than the food, and the wedding reception the Queen of France threw for one of her ladies-in-waiting was no exception. Royal adviser Hugh of Guisay had the bright idea to stage the traditional mocking/celebrating of a remarriage by having performers dance around wildly dressed as uncivilized, oversexed “savages.” He had the even more incendiary notion that King Charles VI should be among them. The dancers donned (or were sewn into) full-length cloth suits dipped in resin or tar to which a shaggy outer layer was adhered, making them appear as monsters or beasts. Although both contemporary and later accounts offer slightly different takes on the reason for subsequent events, they all agree that the Duke of Orleans had a torch, the torch got a bit too close to one of the dancers—and their costumes, with them inside, blazed up in a roaring inferno. The king survived when a quick-thinking duchess threw her skirts over him to staunch out the oxygen flow; another dancer flung himself into the nearest source of liquid—a barrel of wine. The other four men burned gruesomely to death in full view of everyone at the party. Among other indecent acts, they killed a knight, put him on a spit, and roasted him with his wife and children looking on. After ten or twelve of them raped the lady, they wished to force feed them the roasted flesh of their father and husband. The bevy of textual and woodcut sources documenting Dózsa’s execution make it Example A of “anything a fiction author can come up with, history has already done it worse at least once.” For leading a crusade/rebellion that ultimately failed, Dózsa received a sentence that unites all the means and meanings of inflicted violence we’ve seen so far. To mock him as a “peasant king”, he was tied onto an iron “throne” that was slowly (slowly) heated. A red-hot iron crown was forced on his head and a burning scepter shoved into one hand. Dózsa endured this for over an hour—and that wasn’t even the worst part. In the middle of a veritable party atmosphere, with musicians playing and hymns of praise being sung around them, a group of Dózsa’s followers were let loose on the wounded, dying man. Let loose, that is, to eat him. On penalty of their own immediate executions, they had to rip out Dózsa’s flesh with their own teeth. Ultimately, Dózsa’s corpse was quartered as a final indignity. The pieces were dispatched to different parts of Hungary to be displayed to the public as a bloody, graphic warning. Even beyond the subhumanity of forced cannibalism by the other defeated rebels, the rending of the flesh and its consumption completes the inverted Passion of Dózsa’s death. Whereas Christ stormed into the hellmouth to defeat Satan, in 1514 Hungary, the mouths of hell closed around the failed crusader forever.